Phylicia Matusz takes a break during summer training in Vilseck, Germany, as part of the RIT Army ROTC program. She will graduate with a degree in biomedical sciences, and be stationed at Ft. Rucker, Alabama attending flight school. RIT’s Army and Air Force Commissioning Ceremonies take place on Saturday, May 12. The Army ROTC event begins at 6 p.m. in Ingle Auditorium in the Student Alumni Union. The Air Force event begins at 5 p.m. at the National Warplane Museum, 3489 Big Tree Lane, Geneseo, N.Y. Receptions follow each ceremony. Phylicia Matusz will trade the chilly weather of Rochester for balmy Alabama where she will be stationed for 18 months training to fly Army helicopters. Christopher Tran will be stationed in Virginia and start work as a cyber warfare operations officer. As students in RIT’s Army and Air Force Reserve Officer Training Corps programs, Matusz and Tran moved through the ranks from trainees to leaders. It is experience they’ll need once the pomp of graduation ceremonies end and commissioning as an officer begins. Both students will graduate with academic degrees from RIT, and earlier in the day, they will be formally commissioned as second lieutenants—Matusz in the U.S. Army and Tran in the U.S. Air Force. Tran was drawn to RIT’s computing security program and joked about how Rochester’s snowfall would be oddly reminiscent of Pittsburgh where he grew up. “When I was going through the career search process in high school, I really wanted to be a fighter pilot and was also interested in what military life would be like so I joined the ROTC program as soon as I came to RIT,” he said. Once here, he immersed himself in the program and moved up with the cadre’s ranks. 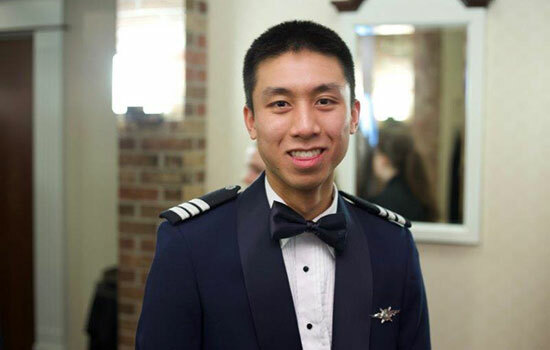 “Every semester, we are put in different positions in order to test and build on various management and technical skills,” said Tran, who served as Cadet Vice Wing Commander, responsible for airwing discipline and monitoring cadet training activities, and last semester as Cyber Support Squadron Commander. His team was responsible for building a comprehensive cadet records management system, a project that aligned with his future responsibilities in cyber security for the military. “This work is important because as we all continue to closely integrate technology into our lives and infrastructure, we become more vulnerable to our adversaries,” said Tran, who will graduate with a degree in computing security. “People—like me—walk around with smartwatches, smartphones, FitBits, etc. We do our taxes, banking and social networking online. These devices and services produce sensitive information about our citizens that could be very dangerous if put in the wrong hands. Matusz took a similar path, coming to RIT as a National ROTC scholarship winner. She selected RIT for its “small school feeling.” She also grew up on the Jersey shore, so family would be nearby. “The most appealing thing about the Army to me is the camaraderie and lifelong friendships you establish, as well as the opportunity to learn from leaders before you, and pass on knowledge and experience to those after you,” said Matusz, who will receive a degree in biomedical sciences. Last semester, she was the Cadet Battalion Commander, responsible for coordinating cadet training activities on and off campus. 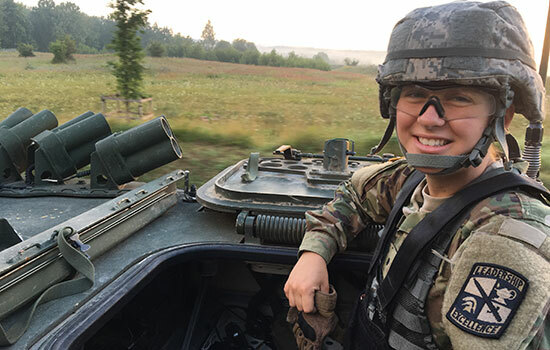 This semester, she led recruiting operations and worked as staff assistant in the ROTC office located in RIT’s College of Applied Science and Technology. Nearly 15-20 students, on average, in each of the ROTC service programs graduate and are assigned to Army and Air Force bases across the country. RIT’s programs have been part of the campus community since the 1960s, and alumni have served around the world.